Inventory in Dallas’ high-rise condo market is still thin. But if a couple of developers are willing to take on the risk, we could see another construction boom. Dallas condo buyers looking for the two Ls—luxury and location—have few options in and around the urban core. As nationwide demographic shifts make high-rise urban living more desirable in Dallas, potential buyers continue to be met with a lack of inventory. But as a couple of local factors play out—namely the stabilization of Museum Tower and forthcoming new developments—Dallas’ high-rise condo market could be poised for its grand entrance. Living in an extravagant high-rise may be common in coastal markets like Miami or Los Angeles, but Dallas historically has had low inventory compared to cities of similar size. The neighborhoods in and around Dallas’ central business district account for 25 Class A (or luxury) condo properties and 3,284 units, according to CoStar. Growing inventory has slowed in Dallas-Fort Worth recently, and condo sales are down 2.5 percent year-over-year, according to the Texas Association of Realtors. Many local developers are looking at nationwide demographics to prove there’s ample demand in Dallas, but getting the presales and financing to bring a luxury high-rise condo tower to the Dallas core is still an uphill battle. Before the 42-story Museum Tower was even completed in 2013, the condo project was facing a slew of issues related to the tower exterior’s reflection on the surrounding Arts District—namely, the Nasher Sculpture Center’s priceless works of art. The bad press (you may recall the 2012 D Magazine cover story titled “The Towering Inferno”) and outcry from the local arts community, compounded with questions regarding the controversial lender for the $200 million project—The Dallas Police & Fire Pension System—resulted in sluggish sales. Two years in, only about a third of the building had been sold. Having finally climbed out from under its own shadow (or blinding glare, depending on your perspective), the building’s 106 units are now 90 percent sold. The stabilization made Craig Hall comfortable enough to break ground on his own Arts District condo tower, called HALL Arts Residences, in 2017. “Museum Tower was just an odd situation. … It slowed down the whole marketplace, but I think that’s now passed,” he says. Hall plans to complete his 28-story condo tower in 2020. It will have up to 50 units, starting at $2 million each. Setting aside the anomaly at Museum Tower, some call Dallas condo buyers a “see-it-to-believe-it” bunch. Emily Ray-Porter, a Realtor at Dave Perry-Miller who’s specialized in high-rise sales for 13 years, says the buyer profile has shifted in the last several years. “As more buildings have been built here, the market has evolved. Seven or eight years ago, people weren’t as willing to buy something they couldn’t see beforehand … but now the most sophisticated buyers are looking at the history of the developer, so there’s a level of trust,” she says. All over the country, condo ownership has been going through the proverbial roof in recent decades. Census data showed condo ownership increasing by more than 130 percent in Texas from 1980 to 1990, and that trend was mirrored nationwide. Compared to 2008, when the financial crisis hit, condo absorption had more than doubled nationwide by 2013, according to CoreLogic. Closer to home, condo sales in DFW were up 10.3 percent between August 2016 and July 2017, according to the Texas Association of Realtors. Regardless of where buyers are coming from, more and more people want to live in a dense, urban area. “All buyers want walkability. Compared to the past, buyers are not as concerned about traffic and noise,” Ray-Porter says. Many of her clients are relocating from another major metro and are used to living in the heart of the city. Like the rest of the U.S., luxury condo buyers in Dallas look different than in past years. For one thing, empty nesters are increasingly drawn to urban settings. Donna Smith, who runs sales and marketing at the Residences at the Stoneleigh building downtown, says her buyers come mainly from the Park Cities and are looking to downsize after their kids go off to college. Units at the Residences at the Stoneleigh start around 2,400 square feet and are priced at about $1.5 million finished. The project’s first homeowner arrived in December 2014. Today, the Residences are 63 percent sold—a figure that Smith feels confident about, given the fact that she’s selling shell space that homeowners come in and finish out themselves. Ray-Porter says the most popular buildings are the ones with hotel-style amenities. Research proves as much. A recent study by Better Homes and Gardens Real Estate found that buyers of luxury homes—both condos and townhomes—are willing to give up square footage for access to better amenities. Chief among them, Ray-Porter says, are hotel amenities—such as a luxury pool or concierge—typically found at buildings like The Ritz or The W.
Harwood’s Bleu Ciel has had strong sales since it opened. Bleu Ciel, Harwood International’s 33-story condo tower, where residents started moving in earlier this year, stresses its amenities such as a residents-only spa and street-level grocery that will deliver to residents. The tower has strong sales thus far, according to Harwood, though it declined to share specifics about units sold. “We have been ahead of the game since we launched Bleu Ciel,” Senior Sales Associate for Bleu Ciel Andrew Danna says. 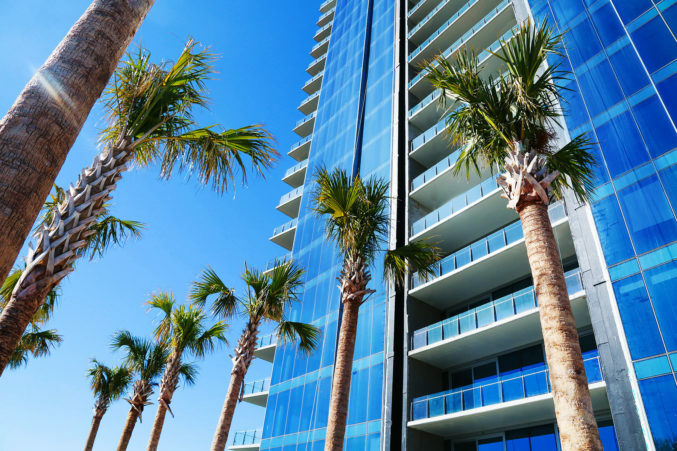 “I’m surprised we haven’t seen more condominium projects coming to the market. Nevertheless, it’s been great for Bleu Ciel.” The tower has a high walk score and sits within the 18-block Harwood District and adjacent to Uptown—all factors, Danna says, that help it capture sales.